A good fireworks picture can be one of the most spectacular picture you take, and the opportunity comes only once or twice a year. 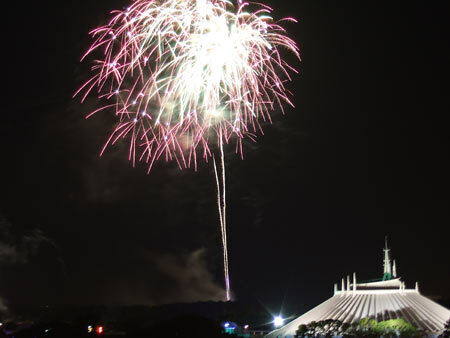 How can you take good fireworks pictures with your digital camera? It's not too difficult and you don't need an expensive digital camera to do so -- but there are a few pointers to keep in mind. First, your camera must be able to keep the shutter open for a few seconds of exposure since you want to capture both the initial explosion as well as the luminous trails created by the falling burning particles. If your camera has a Bulb function, then you are in luck. Switch to Manual, set the shutter to Bulb, and the shutter will remain open as long as you press the shutter release button down, and close when you release it. Keep the shutter open and record a burst from the moment it explodes to the time when it starts to fade. If you are taking only one burst, then you're done. If you want to take multiple bursts on the same frame, just put the lens cap (or simply a thick cardboard or even your hand) on instead of releasing the shutter release button. Take the cap off for the next burst and continue this cap on/off process until you are satisfied. Depending on how dark the conditions are, you might need to experiment on how long to leave the shutter open. 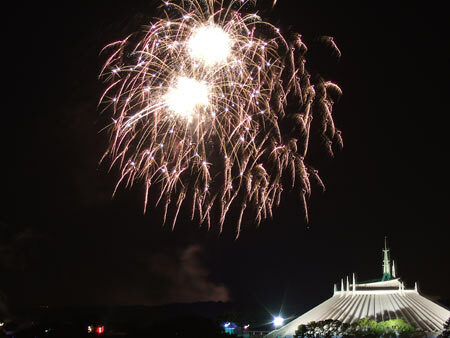 Since you would want to include foreground buildings to situate the fireworks, leaving the shutter open for too long may cause these buildings to be overexposed. You might want to experiment with the aperture to use. A small aperture such as F8 will make the burst trails thin and dark, whereas a larger aperture such as F2.8 will make them thicker and lighter. If your digital camera does not have very slow shutter speeds, or shoots only in Program AE mode, it is a bit more challenging. The aperture used would most probably be F2.8 resulting in thick and light lines, which are less appealing. If you can, zoom in for this usually also closes down the aperture. If you do not have Bulb setting, then switch to Manual, or Shutter-Speed, or Aperture-Priority mode. Most Point-and-Shoot digital cameras will not have any of those modes, but will usually have Night Scene mode, or Slow Shutter scene mode. Choose whatever mode that will give you a shutter speed of about 3 sec. and more. In the image examples in this tutorial, I set the camera (Fujifilm FinePix F10) to Night Scene mode which gave me a shutter speed of 3 sec. I zoomed in a bit and that restricted the aperture to F4.7. I also set the ISO to 80 (the lowest on that particular camera) to prevent overexposure when using long shutter speeds. The camera was set on a tripod with the center pole extended above the balcony railings of the room I was staying in at the Disney Contemporary Resort. 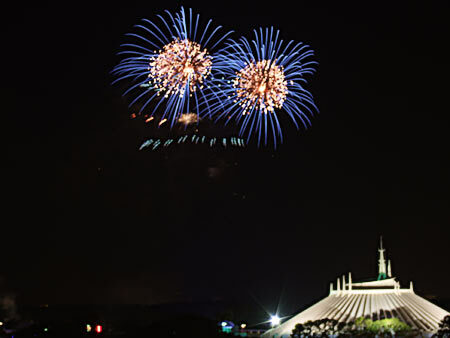 The room was on the 7th floor of the tower and faced the Magic Kingdom [you gotta ask for it or your room will face the lake or garden]. 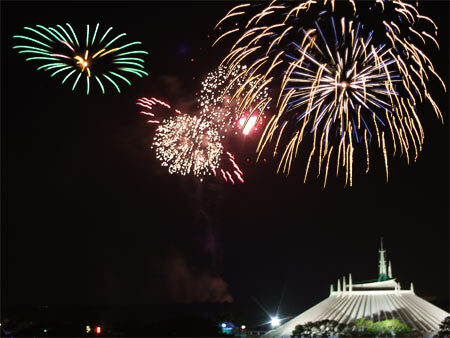 Because of the angle, I could not include the Cinderella Castle in the shots, so included the Space Mountain instead. - Because you'll be using very slow shutter speeds, you'll find that camera shake is a major problem. Handholding your camera will almost guarantee trails that look shaky. So, use a tripod. Don't forget that with most tripods you can also extend the middle pole to allow your camera to reach over a balcony railing or other obstacle. - Likewise, if your camera allows it, use a release cable or remote controller to reduce camera shake. It's tricky to use a self-timer and capture the bursts just when you want to. - If your camera has a long zoom, then you can fill in the whole area with a single burst. If your camera does not zoom in much, then consider taking two or more bursts on the same frame (if your camera allows multiple exposure on the same frame). - Don't trip the shutter release as soon as the fireworks explode because the extreme brightness of the initial explosion will generally result in overexposure. Instead wait for the trails to bloom fully and then open the shutter to catch the bloom and the falling trails. - You may also want to wait for the last explosions in a series, for too many explosions may also result in overexposure. - No double exposure function or Bulb on your digital camera? Don't worry, the magic of digital photography allows you to sandwich a number of bursts afterwards in an image editing software, such as Photoshop. You can combine bursts as creatively as you desire, even making some appear smaller or larger to achieve a balanced and pleasing composition. - As you can see, a camera that allows you to use long shutter speeds, adjust aperture, has a wide-angle lens (especially if you are going to be relatively close to the launching point) and has a remote controller is ideal. But if your camera does not have all those features, as mine did not, don't let that stop you -- you can still take spectacular fireworks shots with a little experimentation!